Hanoi is willing to assist German investors by connecting them with Vietnamese businesses to run projects in the capital city, stated Chairman of the municipal People’s Committee Nguyen Duc Chung. Russian President Vladimir Putin will meet German Chancellor Angela Merkel on Saturday for talks about the conflicts in Ukraine and Syria, as well as the Nord Stream 2 gas pipeline project that has drawn U.S. ire. Germany’s experience in implementing the 4th Industrial Revolution was shared with Vietnam during a workshop held by the Vietnamese Embassy in German on April 23. 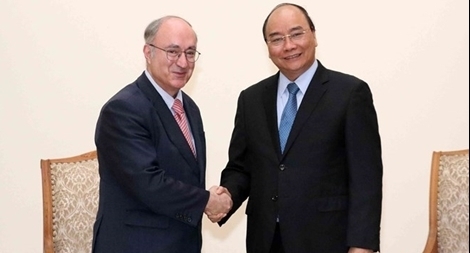 Prime Minister Nguyen Xuan Phuc has urged Germany, especially Rheinland-Pflaz state, to further boost trade and investment with Vietnam to further lift two-way trade. German Foreign Minister Sigmar Gabriel has met Israel's Prime Minister Benjamin Netanyahu in Jerusalem to discuss a number of pressing issues, including the future of the Israeli-Palestinian peace talks. PSNews – 3-day German-style Christmas fair and concerts officially opens in Cua Bac Church, Hanoi. Prime Minister Nguyen Xuan Phuc on September 25 sent a letter of congratulations to Chancellor Angela Merkel over her Christian Democratic Union (CDU) Party’s victory in the German parliament election for the 2017-2021 tenure. Disgraced former German President Christian Wulff has been criticized for taking a job with a Turkish clothes shop. German politicians have said the job with fashion retailer Yargici was unbecoming for a former head of state. German lawmakers on Friday passed a controversial law creating tight deadlines within which social media companies such as Facebook must take down posts containing hate speech or face fines up to 50 million euros ($56 million). Six selected films will be screened for free at Hanoi’s Kim Dong Cinema during the German film festival for children and young audience from May 25 to 28. The Vietnamese delegation, as an invited guest, has called for G20 countries to promote inclusive development at the third G20 Sherpa Meeting in Munich, Germany, on May 18-19. Social networks that fail to remove defamatory “fake news”, hate speech and other illegal content will be fined up to €50m (£43m) under new plans agreed by the German government. Vietnamese artists will join German and Japanese peers in a special concert at the Opera House in Hanoi on April 14. Germany is interested in climate change adaptation projects in the Mekong Delta, Vice President of the German parliament Edelgard Bulmahn said at a working session with the Steering Committee for the Southeastern Region in Can Tho city on November 17. PSNews - Senior Lieutenant General To Lam, Minister of Public Security met Mr. Christian Berger, Ambassador of the Federal Republic of German to Vietnam and Mr. Prak Nguon Hong, Ambassador Extraordinary and Plenipotentiary of the Kingdom of Cambodia to Vietnam on October 27 in Hanoi.